I find myself writing about the sampeah quite a lot in my new book, because it is a gesture that fascinates me. For those who don't know, the sampeah is the greeting gesture found throughout Southeast Asia where the greeter brings her/his hands up in a prayer position in front of the body. Most people know it from a holiday to Thailand, where the ubiquitous gesture manages to charm tourists and encourages them to emulate it, normally to bad effect. For the sampeah is a complex and finely instrumented gseture, and it incorporates tiny and subtle differences that change depending on who is greeting and who is being greeted. To make matters worse, these differences can themselves change from region to region. It is such a potential minefield that, in Thailand, Cambodia and Laos, I leave the gesture alone altogether, not wanting to offend unintentionally. 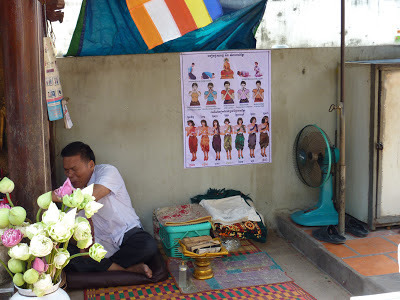 Apparently the sampeah was once in common use in Vietnam, but these days it remains only as a greeting within the confines of Buddhist monasteries, where it has been hugely simplified into one basic gesture, the making of the palms together "prayer" sign at chest level, the head bowed slightly. Anyone can master this, and its use is second nature to me when I visit monks or hang out at monasteries in Vietnam. But not so in Cambodia. The thumbs must face different parts of the upper body according to the status of the person you are greeting, and to get this detail wrong can cause serious offence. Cambodian Prime Minister Hun Sen's wife recently caused an international scandal when she greeted President Obama with a sampeah intended for someone of lower status in what some say was a deliberate act. 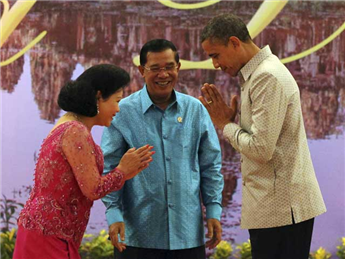 Did Hun Sen's wife deliberately snub Obama with her sampeah? The sampeah, too, has an unexpectedly traumatic history in Cambodia. Pol Pot banned its use during the Khmer Rouge years, identifying the status-conscious greeting as a remnant of feudal society. When I first went to Cambodia in 1996 I rarely saw the sampeah performed - people had simply fallen out of the habit, or had instructed their psyches to stop it during the years when doing it could get them killed. These days it is undergoing something or a comeback, and young people are taught the gesture and instructed to use it when greeting adults and monks. People in the 40 - 60 age bracket still seem to dispense with it, though.